Who will make the roster as the third running back? Jordan Todman or Lex Hillard? It may be hard to believe, but the NFL season is here and the Vikings kick off preseason action Friday in the "City by the Bay." Roster battles will begin and rookies will begin fighting for their spot on the active 53-man roster. There will be many position battles and we will give you the top three position battles for week 1 of the preseason. This position has more depth then most people in the organization first believed. Of course the injury to Greg Childs was something the Vikings didn't want to happen as quickly as it occurred. 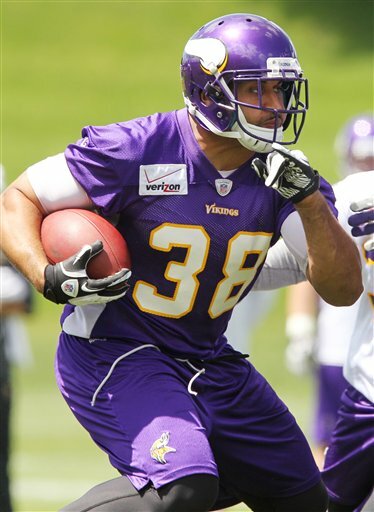 The immediate reaction was that the Vikings would be looking for veterans to take Childs spot on the roster. I don't think this is at all necessary after you take a long look at the roster. With receivers Manny Arceneaux, Devin Aromashodu, and Michael Jenkins all capable of playing the split end position, there is no reason to be nervous. In addition, Jerome Simpson will return in week 4 after serving his three game suspension. Furthermore, Percy Harvin can make big plays and has the ability to stretch the field. This poses the question, how many receivers will make the roster? I believe it will be 6 or 7, but it all comes down to who plays well in the preseason. With Bryan Walters, Jarius Wright, Stephen Burton, and Kamar Jorden all in the chase to make the roster, it will be an interesting position to watch during the preseason games. We know Toby Gerhart, and Adrian Peterson will be the first two running backs on the depth chart, but who will be the third running back. Jordan Todman has battled a sprained ankle for the last week, but was emerging before the injury. Lex Hillard has a strong background as a backup for the Miami Dolphins. I like his ability to bounce off tackles and he looks great in space. If Todman's ankle injury continues, the proverbial durability flag will go off in the minds of the coaching staff. The Vikings want running backs who will be durable and right now it seems Hillard is the better durability option at this point. This will be an interesting battle as we get into the latter part of the preseason. This will be by far the most difficult positon battle on the whole roster this season. The main staples on the defensive line will remain the same which includes, Jared Allen, Kevin Williams, and Brian Robison. Letroy Guion likely will become the new "man in the middle" next to Kevin Williams this season. It wll be very interesting to see if Christian Ballard puts up a battle and challenges Letroy Guion for the nose tackle position. Based on the current play of Letroy Guion, Ballard will not touch Guion's starting role, but it is something we will have to look for. Can a rookie like Trevor Guyton make a roster full of competitive defensive linemen? I like Guyton's physical presence as a back up on the defense line. At practice he makes himself known and plays well in 1 on 1 drills. In his career at California, he was an excellent defense lineman and many analysts talked about his ability to take over the game. He is the type of athlete the Vikings need as backup role player. In addition, players like former Arizona defensive end Nick Reed and former New Orleans Saints defensive end Jeff Charleston will battle for what could be the final spot on the roster. They both will be battling for the defensive end role to back up Jared Allen. This spot is very open because neither Charleston or Reed has emerged as a potential suitor. D'Aundre Reed is nearly a lock as a back up to Brian Robison at defensive end. Reed has been a force at practice; I really like his speed off the edge and his ability to stay home on the run. Overall, these questions won't be answered until the preseason is nearly over, but players will begin working to earn their spot. It will be interesting to see who emerges at these positons over the next three weeks. 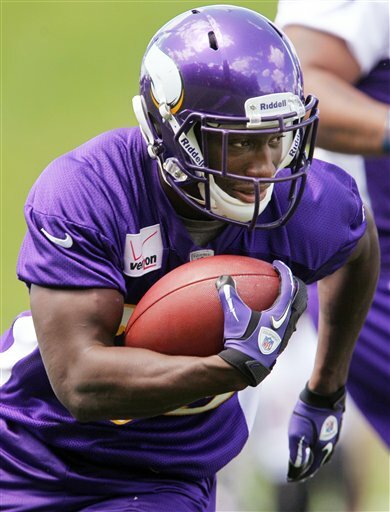 Vikings Corner is your one-stop spot for continued Training Camp and Preseason Vikings coverage!